This woman was adopted at birth and wrote a plea in our magazine asking readers to help find her biological mother and her long-lost niece reached out to us. In Simply Her’s June 2006 issue, Hayati Jantan, a Chinese woman who was adopted as a two-week-old baby to a Malay couple 45 years ago, made a plea to readers to help find her biological mum. A few weeks after the issue hit the newsstands, flight stewardess Audrie Poh, 24, bought a copy and identified Hayati as her long-lost aunt. On 10 June, Hayati met her five natural siblings, the Lims, in a tearful reunion that was splashed across the pages of The New Paper, Berita Harian, Lian He Zao Bao, and also on the news bulletins of TV channels Suria, 8 and U. “I didn’t go into this search with much hope, so you can imagine my surprise when Crime Library, the organisation that was helping me spearhead the mission, called with news that a Simply Her reader had identified me as her aunt. I’m very grateful Simply Her picked up my story,” says Hayati. The Lims have also presented Simply Her with a certificateof appreciation for helping them find their long-lost sister. When Audrie Poh was reading Hayati Jantan’s story in Simply Her in the wee hours of a June Saturday, little did she expect to be looking into the face of her long-lost aunt. “I was lying in bed, reading about how Hayati was looking for her natural family, when I saw my grandfather’s name and grandmother’s surname in the article. I remember that my grandma was heartbroken about being forced to give up her fourth child called Peng Hoon and had spoken about it before. Could Hayati be my aunt? I was so excited I rushed into my mother’s bedroom to wake her up,” she recounts. It was almost 3am, but when mum Lim Peng Mui saw the photo in the magazine, she knew she had found her sister. After tossing and turning in anticipation the entire early morning, she called up her whole family when dawn broke to convey the good news. Says Peng Mui, a 51-year-old housewife and the eldest of the six Lim siblings: “We came together on Sunday and compared the details in the magazine to Hayati’s birth certificate and adoption papers that were in our possession. Everything matched. On Monday, Audrie called up Crime Library, the volunteer-run society that helps people find their longlost family members, and one week later, the Lims were finally reunited with Hayati. 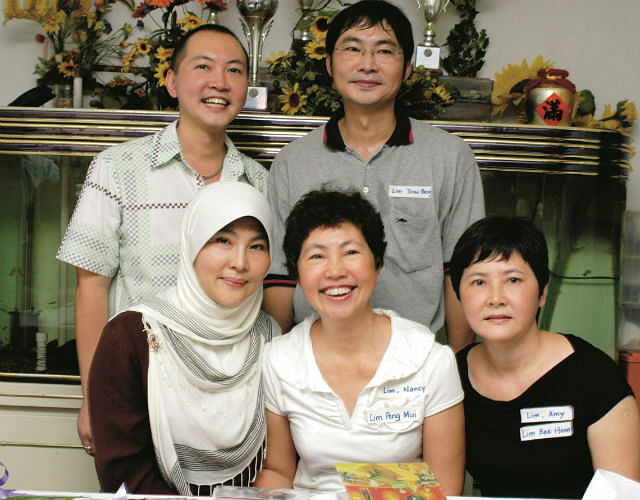 At the Jalan Kayu home of third sibling Yeow Beng, a 47-year-old general manager, Hayati didn’t just meet her biological siblings, but also the entire clan, including 11 nieces and nephews. in 2001 and 2003 respectively. “I was flying then, and was dying to know how the reunion turned out,” says Audrie. “Despite being separated for almost half a decade, my whole biological family has been so warm and welcoming. The same blood runs in our veins I guess! “At the reunion, my eldest sister Peng Mui showed me photos of my mother and my fifth sibling, Fire, introduced me to everybody. After that, Fire called me up to find out how I was doing and my youngest sister Marjory even took me and my kids out for lunch. Just the other day, I was so surprised to receive a call from my older brother Yeow Beng, who’s quieter than the rest, inviting me to join him for a golf session. “My three kids and adoptive family and friends were also really supportive about my search and now that my dream is realised, they can’t be happier for me. My only regret is that I didn’t get to see my mum, who had tried to search for me several times before she died five years ago. Nonetheless, there will be so much to talk about with my family in the days ahead. “I’m going to take up a conversational Chinese course so that I can communicate better with my two oldest sisters, who don’t speak very much English.